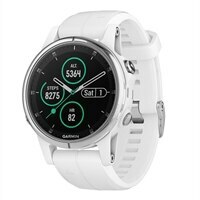 Garmin fenix 5S Plus Sapphire - GPS/GLONASS/Galileo watch Hiking, Running, Swimming 1.2 inFor athletes and outdoor adventurers, the fenix 5S Plus multisport GPS watch is the rugged, high-performance timepiece that meets big challenges and fits smaller wrists. Beat yesterday with premium features that range from routable TOPO maps and storage for up to 500 songs to estimated heart rate at the wrist and Garmin Pay, the contactless payment solution. fenix includes a comprehensive navigational toolset that allows users to plan trips and create routes, record waypoints, such as campsites or points of interest, and record GPS bread crumb trails on the move (tracklogs). Adventurers can navigate to coordinates, along a track or route, towards waypoints, geocaches or along any other selected bearing. A navigation arrow provides clear directional guidance and the TracBack function can guide one back along a previously recorded tracklog. This provides adventurers peace of mind knowing they're never "lost" and can easily find their way back in case of an emergency or bad weather conditions. Also included is a worldwide basemap displaying cities nearby. Using the BaseCamp desktop application, fenix users will be able to easily plan trips and share their adventures with friends and family. fenix is equipped with both ANT capabilities and Bluetooth to wirelessly share tracks, waypoints, routes and geocaches with other compatible Garmin devices. A Basecamp mobile app allows users to transfer waypoints and tracklogs to view them on a more detailed map and larger screen of select smartphones. fenix is equipped with ABC sensors (altimeter, barometer and compass) to provide explorers relevant real-time information. The built-in altimeter provides elevation data to accurately monitor ascent and descent, the barometer can be used to predict weather changes by showing short-term trends in air pressure and a 3-axis electronic compass keeps the user's bearing whether he's moving or not. Utilizing its GPS receiver, fenix can auto-calibrate its ABC sensors and also auto sets the time based on location. For an extremely accurate temperature reading, fenix can be paired with tempe, Garmin's new external temperature sensor. Similar to Garmin's running watches, fenix provides real-time performance data, such as distance, pace time and calories, helping outdoorsmen keep track of their progress during and after their adventures. This is especially useful to keep track of fitness activities off the beaten track, such as adventure or trail running. fenix is also compatible with Garmin's premium heart rate monitor for heart rate info and with a speed/cadence sensor for distance, speed and cadence while on a bike. The displayed data fields are fully customizable right from the watch. fenix is built to endure the toughest outdoor conditions, combining a high-strength housing to survive shocks with a mineral glass lens to resist scratching. It boasts a large LCD display with LED backlight and a robust polyurethane wristbands. Garmin's outdoor watch is waterproof to 50 meters and has a battery life of up to 50 hours in GPS mode (depends on settings) and up to 6 weeks in watch mode. Basic watch functions include alarms, tones, vibration alerts, timer, stopwatch and world clock with the ability to display several times zones at once. For athletes and outdoor adventurers, the fenix 5S Plus multisport GPS watch is the rugged, high-performance timepiece that meets big challenges and fits smaller wrists. Beat yesterday with premium features that range from routable TOPO maps and storage for up to 500 songs to estimated heart rate at the wrist and Garmin Pay, the contactless payment solution.